Canadian online casino reviews, free casino games, casino bonuses, news, expert guides & more. Soar through the universe and collect multipliers and respins in the latest slot creation from Playtech along with calming sound effects and planets as symbols. The latest slot release from Playtech will allow players to explore the vast and endless cosmos while collecting respins and multipliers with each and every spin. The slot is called Galactic Streak and it takes place in outer space, complete with planets, galaxies, and a plethora of sparkling stars that accompany you during your reel-spinning adventure to riches. 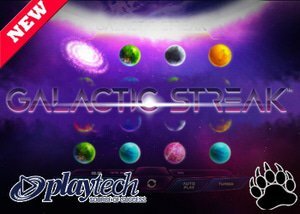 The new Galactic Streak slot from Playtech online casino software is spectacularly presented across 4 reels with 4 rows and features 20 non-adjustable paylines. Players will also be treated to a magnificent selection of slot features, including Burning Sun Wild symbols, Galaxy Scatter symbols, multipliers, and Galactic Free Games along with a top jackpot prize worth 125 times your total bet. The yellow burning sun will be your wild symbol on the reel set, standing in for all planet symbols to potentially generate a win. The burning sun wild symbol will also produce the highest jackpot prize worth 125 times your total bet when 4 are displayed on the 4x4 reel structure. Furthermore, it will also be frozen in place once it's displayed to hopefully generate another winning combination on the next spin. The new Galactic Streak slot also comes equipped with Stellar Multipliers on each and every spin. This basically means that you can earn yourself multiplier values during the base game for any winning combination you trigger. The winning symbols that form part of a winning combination will each receive a multiplier value starting at x2. This multiplier value will last for a duration of 3 spins and has the ability to increase up to a maximum of x10 if you are lucky enough to continuously land winning symbols on the same payline. The galaxy presented in white and pink colours will act as your scatter symbol in the game and you will need to display a minimum of 3 galaxy scatter symbols to unlock the Galactic Free Games feature. Once activated, you will receive 10 Galactic Free Spins and the multiplier values that you accumulated during the base game will also be transported over to the free spin feature for the opportunity to unlock even more astronomical wins. The new Galactic Streak slot from Playtech boasts with an array of convenient betting options even though the slot is limited with 20 fixed paylines. You can choose between 8 different line bet denominations, ranging from $0.01 up to $2.00. This will give you a minimum bet of $0.20 per spin along with a maximum bet of $40.00 per spin. To further compliment the overall look and feel of the game, Playtech went the extra mile by using an assortment of vibrant and colourful planets as symbols on the reel set. You will find two red planets paying the highest standard jackpot in the game worth up to 50 times your total bet along with an orange planet, a pink planet, a dark blue planet, a turquoise planet, a green planet, and a grey planet. The new Galactic Streak slot comes with a return to player ratio of 96.21% and is available at all Playtech casinos in December 2018. Available on desktop, mobile, and tablet devices, we recommend that you play the new Galactic Streak slot at Winner Casino where you'll be treated to a jaw-dropping 400% match up to $800 along with 25 free spins on a variety of Betsoft games to get you started. Contact Us Disclaimer Employment About Us Privacy Copyright @ Grizzly Gambling 2012-2019. All Rights Reserved. Be the first to know about new online casinos, the latest free slots games and receive exclusive promotions. We guarantee privacy, so your email is safe and secure. Welcome to grizzlygambling.com - the whole team welcomes you to our player community. It is our mission to inform members of the latest events on the Canadian market so you can enjoy the best in online casino gambling.